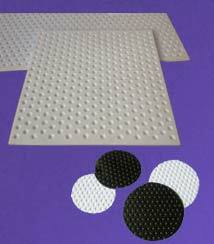 PTFE Dimpled Sheets are the specialised sheets that are mainly manufactured from water- proofing. These Sheets are very easy to apply and easy to use. We manufacture these Sheets in a way that these Sheets protect the below surface of product from even the tiny droplets of water that can harm the product. We supply these Sheets according to the customers requirements, that is, the thickness, length, and breadth depends on the customers demand.